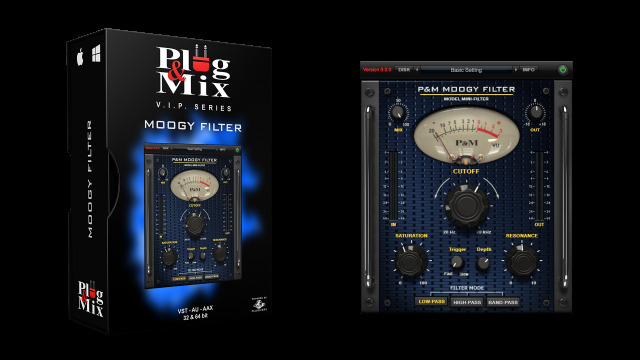 Having a P&M Moogy Filter is like bringing home a classic vintage filter pedal for use on all of your tracks. This plug-in’s great sounding filter can be driven with it’s built in saturation for crunchy tones and it also has an envelope follower to give that extra bite. P&M Moogy Filter has three filter modes: Low-Pass, High-Pass and Band-Pass, which makes it extremely versatile for use on all kinds of material: Whether its percussion, keys, vocals or as a DJ effect, Moogy Filter will make your tracks sing. - CUTOFF - Controls the cutoff frequency of the filter. - SATURATION - Drives the filter and causes crunch distortion tones. - RESONANCE - Determines the strength of the filter at it’s cutoff. - TRIGGER - Sets the speed of the filter envelope. - DEPTH - Sets the depth of the filter envelope. - FILTER MODE - Choose from Low-Pass, High-Pass or Band-Pass filter types.